On this tour with me, you will get the most authentic expeience around the Spanish capital. Ypu will be tasting the most local products while learning about the production process and history of all that you eat. 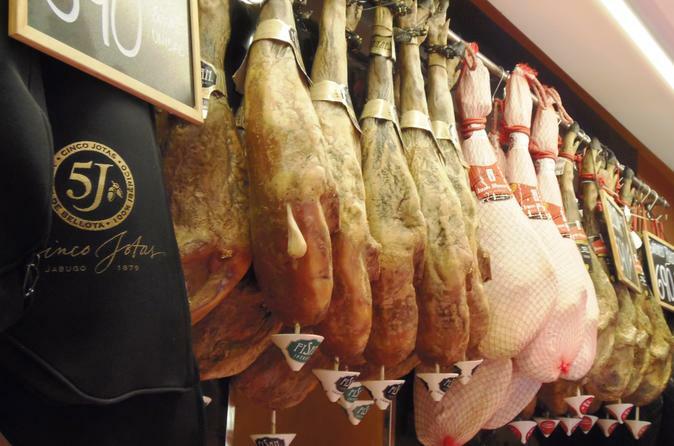 We will meet in the most well-known and iconic plaza in Madrid and from there begin our journey to jamonerias that are sellng hams and cured meats like they have been doing for years! We will also taste local cheeses at San Miguel Market, just a short walks away from Plaza Mayor. You will learn how to pair the cheeses with Spanish wines, so you can then throw the best tapas parties when you get back home to impress your friends and family. This tour is one to not be missed! If you are looking for a relaxed and comfortable tour, led by a local, then this is for you! I cannot wait to show you my beautful city and take you to wonderful shops that most tourists would miss while visiting. If you are a ham, cheese and wine lover, then this is the perfect experience for you. Indulge yourself with the top delicacies that Madrid has to offer, from Chorizo and lomo hams- to the tasty manchego cheese. All of them paired with local wines, while learning everything about their production from an expert. Your tour is led by a local guide who will share their knowledge and the secrets of Spanish delicacies with you. Whilst you wander around this gorgeous city, visiting a traditional jamonería (ham shop) where you will taste not only hams but also chorizo, lomo and manchego cheese, you will also learn more about Spanish wines and how to pair them with ham and traditional Spanish cheese.